Are you wondering how to stay cool as a cucumber this summer? Keeping hydrated is important year round, but especially in the warm weather, as it prevents our bodies from overheating. To remain cool during the dog days of summer, here are five delicious and hydrating foods to add to your menu. Blueberries are one of my favourites, as there are very few naturally blue foods. They work perfectly in many summer dishes, including fresh desserts. Every summer, I like to chill with homemade blueberry crumble. It's one of my go-to recipes that I take to backyard BBQs. Blueberries have a long list of health benefits. Like most berries, they are packed with water, vitamins and antioxidants, which can help the body remain hydrated. You can add blueberries to smoothies, salads and yogurt. And of course, they can be enjoyed on their own too! Cilantro is an herb with a very distinctive, refreshing flavour. I love pairing fresh, chopped cilantro with lime juice for the perfect cooling effect during the warm summer months. Cilantro is rich in vitamin A, which promotes eye health, and vitamin K, which is good for bone health. In addition, cilantro may be beneficial for digestive health. You can add cilantro to soups, stir-fries, quesadillas and tacos for its cooling effect. Cucumbers are naturally hydrating; they are often used in skin treatments because they are 96 per cent water! I always have sliced cucumbers on hand in the summer, and they come in handy to refresh after a long day of travel. They are very low in calories and are a good source of vitamin C for immune health, vitamin K for bone health, and potassium for heart health. You can add cucumber to water, use it to garnish sandwiches, and blend it with diced watermelon and chopped mint for a hydrating side salad. Until I travelled, I always drank cold beverages to cool down. During my time in Turkey, I was spritzed with lemon water while traveling on non-air-conditioned buses, and refreshed by the amazing cooling effects of lemon mint tea. It was the perfect thing to cure the travel heat sluggishness. Mint is a good source of vitamin A, which promotes eye and immune health. Research suggests that mint reduces inflammation and helps promote digestive health. You can add mint to your summertime potato salad recipe, barley and lentil side dishes, and of course, make homemade lemon mint tea! 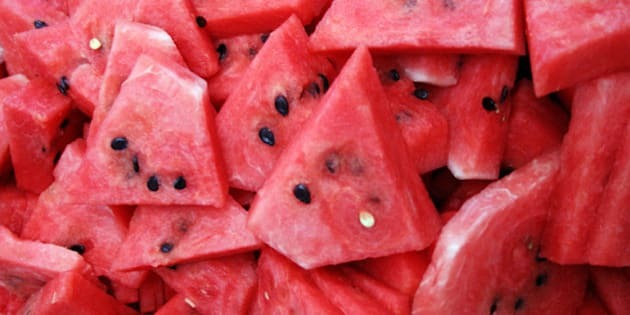 Nothing says summertime like chomping into a slice of thirst-quenching watermelon! Watermelon is one of my fondest childhood food memories. I love snacking on a slice mid-afternoon with a small amount of Greek yogurt. Made up of mostly water and natural sugar, watermelon contains both magnesium and potassium, which are important for regulating fluid in our bodies. Plus, it has the added bonus of the antioxidant lycopene (giving it the beautiful dark pink colour), which supports immune and heart health. You can add watermelon to salads, make chilled soups with it, and combine it with sliced cucumber and mint for a refreshing side dish. Stock up on these five delicious, heat-blasting foods for your menu and you'll be cool as a cucumber and well-hydrated for the lazy hazy days of summer!